WCRP: Even before the start of the new school year, middle school and high school students in Mon State start their “tutoring” classes—fee-based extra study sessions before and after their regular classes. 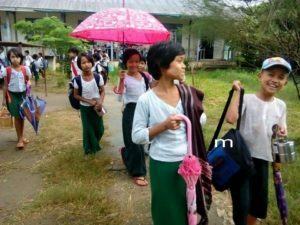 Such “cram schools” are common throughout Burma, where school teachers or people from outside the school system charge a fee to teach the same lessons taught during class time. Most parents want their children to study in private “cram schools” or take extra tuition classes in order for them to pass their exams. Therefore, parents have to find a place for their children before the start of the school year, even if they have to spend a lot of money to cover the extra cost. Before the school year even starts many parents face difficulties in covering the cost of tuition fees. This is fine for the parents who have money to spend. For the parents who cannot afford the fees, this is unfortunately reflected in their children’s test results. “My child is trying really hard in his studies but in this education system you can’t pass exams without taking extra instruction. We couldn’t afford the 1,000,000 kyat ($749.07) or 2,000,000 kyat ($1,498.16) per year for the fee. My child is in ninth grade and I have no money to support him to join tenth grade. I’m really sorry about that,” said the parents of a student from Pa Nga village, Thanbyuzayat Township. All the students in Mon State have to rely on these extra study sessions before and after regular classes. What they study in the class room is very general and both students and parents know they need to take extra tuition to pass their exams. The students have no time to rest, and the parents are forced to worry about the cost.